Available now from the Merchandise page. Reviews are on the Arguments Yard reviews page. 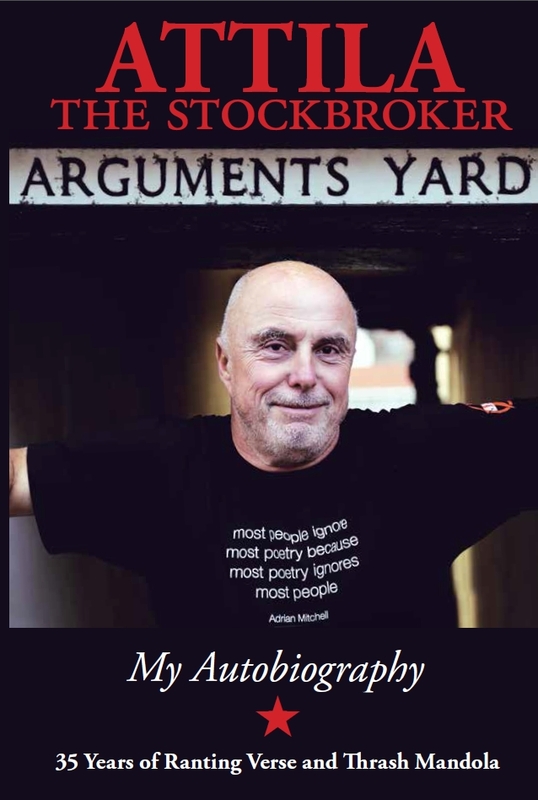 Radical-force-of-nature performance poet/musician Attila the Stockbroker celebrates the 35th anniversary of his first gig with the publication of his autobiography 'Arguments Yard' in September 2015. Launched into public consciousness by legendary Radio One DJ John Peel in 1982/83, he has spent 35 years touring the world as a self sustaining DIY one man cottage industry, performing well over 3000 gigs in 24 countries and releasing 40 LPs/EPs/CDs and 7 books of poetry. He toured East Germany 4 times before the Wall came down and twice more immediately afterwards, was involved in the first ever punk performance in Stalinist Albania and had to turn down playing in North Korea because he was already booked to tour sensible old Canada. He once stood in for Donny Osmond at a gig. He was targeted by fascists during the early Eighties and as well as the physical stuff once had a 10 minute stand up political argument with notorious Nazi band Skrewdriver singer Ian Stuart in the middle of a Black Flag gig at the 100 Club in London's Oxford Street. Having got an encore as the support act, he was thrown out of his own gig by the bouncers on the orders of the main act John Cale, one of his all time musical heroes. His support acts - they've included Manic Street Preachers, Julian Clary, New Model Army and Billy Bragg. He has led his 'medieval punk' band Barnstormer for 20 years as well as the solo stuff - but he did his first ever punk gig as bass player in Brighton Riot Squad in 1977 in Brighton's legendary Vault, where coffins and skeletons from nineteenth century Huguenot plague victims kept coming through the walls. Running the door at someone else's gig there, he once used a nineteenth century baby's lead coffin as a cashbox. Reviewing his first album in the NME, Don Watson said that he would rather gnaw through his own arm than listen to it again! Didn't deter Attila though: that was 32 years ago. Didn't deter New Zealand either: when he arrived for his first tour in 1991 both national TV channels were waiting to greet him at the airport. And when Attila argues with a journalist he knows the score because he is one too, having written for NME, Sounds, Time Out, The Guardian and The Independent among others. He currently does a regular column in the Morning Star. This book is social history and personal story combined: a cultural activist's eyewitness journey through the great political battles and movements of recent times. Rock Against Racism/Anti Nazi League/Anti-Fascist Action, Miners' Strike, Wapping dispute, Red Wedge, Poll Tax, campaigns against two Gulf Wars: Attila has been there, done the benefit and worn the T shirt. There are memoirs from all over the UK and mainland Europe and his many tours of Australia, Canada, New Zealand and the USA, and the centrepiece of the book is the story of his time performing all over East Germany as the campaign for democratic socialist change grew: history observed at first hand. Back home he had done every Glastonbury Festival since 1983 and organizes his own beer/music extravaganza. Glastonwick, in his native West Sussex. He was at the heart of a 15 year campaign to save his beloved Brighton & Hove Albion FC from oblivion. And he tells of a happy childhood ripped apart by his father's death and, forty years later, of how he and his wife nursed his mother through a 6 year battle with Alzheimer's. Above all, though, his message is a simple one: you don't need to be 'a celebrity' to have a wonderful life earning your living doing what you love. You just have to have a way with words, the self-confidence and organizational ability of Napoleon and a skin thicker than the armour of a Chieftain tank.